Ahh... summer's aroma is coming in whiffs through freshly squeezed lemonade, grilled burgers, and sweet corn — just as a reminder that these couple of months are all about spending time outdoors and eating al fresco. Grilling is a big part of the season and no matter whether you're cooking up a vegetable kebab or a pork shoulder, sometimes things can get a little messy. Not only are there flare ups, but there can be some oil or fat splattering and some serious grill grease coming your way. Or you could just trip and spill something on yourself (happens to the best of us). We know that aprons can be superfluous, but if you're going to have one that protects your clothes, shouldn't it be a fun one? Yes, there are the bizarre and sometimes creepy sayings, but how about taking it one step further and making your apron a functional toolbox? Oh yes, it's possible. We've gathered up some quirky grilling aprons in case you need some extra grilling-snazz to impress your friends and family (or just want some goofy gifts to get the grilling buffs in your family). 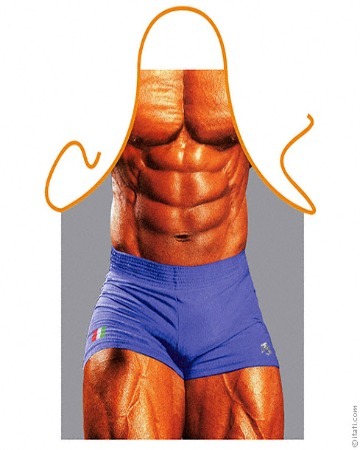 Just in case the man in charge of grilling doesn't actually have a desirable 8-pack, this buff guy apron from NakedAprons will guarantee that you or whoever wears this receives some stolen glances. Wo-wee. 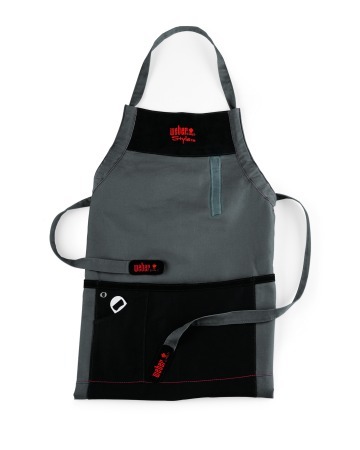 Weber is already famous for their easy-to-use grills, so it's completely fitting that they've designed an apron that is appropriate for all your grilling needs. In case you're entertaining and accidentally drop your favorite set of tongs, this apron comes with pockets for extra storage. For those who love beer, here's another plus: this apron already comes with a handy bottle opener. Can we say party time? We deem this the perfect apron for ultimate grillers. 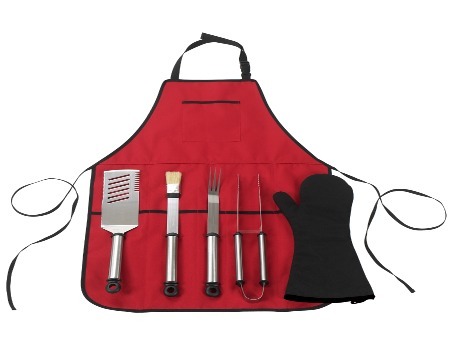 No matter what their grilling needs are, this apron comes with enough room to hold gloves, a spatula, barbeque brush, food thermometer... and a grill. Just kidding, no grill, but this apron also moonlights as a carrying case. 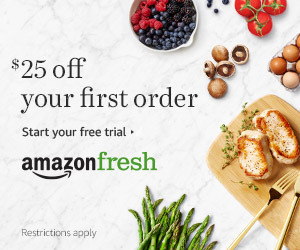 For under $20, this apron is really worth it. What's the use of a grilling apron if it doesn't deflect off the occasional tinys sparks of fire? 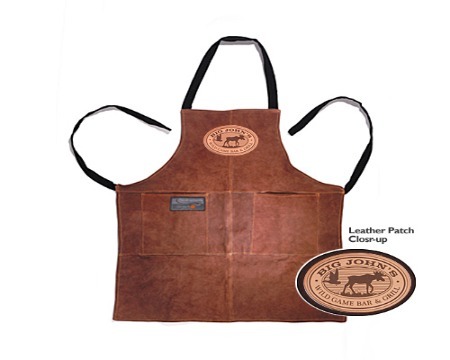 This leather — yes, you read it, leather — apron will not only protect you during the moments when flames accidentally flare up, it even comes with two deep pockets and easily convertible straps in case you're ever on the go.